Welcome to Trenton, New Jersey, a post-industrial wasteland of abandoned factories, neglected row houses and urban decay. Trenton is a relic of America’s once-thriving manufacturing economy, the kind of city most of us have long since forgotten. But for Fred Zara, a 30-something family man living an average suburban life near downtown Orlando, it’s not so easy a place to forget. Growing up in Trenton in the mid-1980s, Fred went by the name of Fred Fatal, played drums in a punk-rock band called Prisoners of War, and was filled with so much teen angst that he managed to get himself kicked out of high school before reaching the 10th grade. 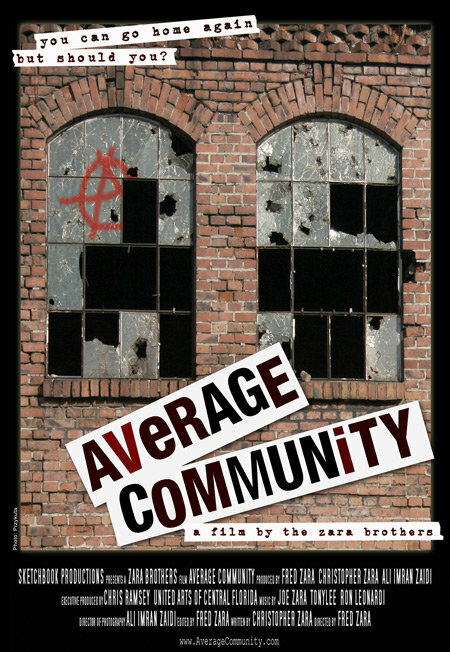 “Average Community” follows Fred on a 900-mile journey back to his hometown to confront his troubled past, and the troubled people in it, in the hopes of understanding how the person he was made him into the person he is. Fred is joined by his two older brothers, one a disheartened New York journalist, the other a free-spirited Seattle musician, as he reunites with old friends, revisits painful memories and tries to make sense of what it meant to grow up in a dying city.